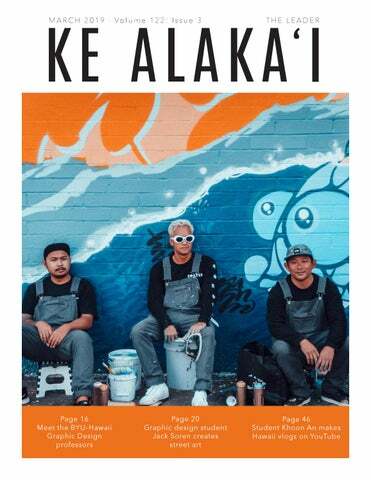 Email: kealakai@byuh.edu Phone: (808) 675-3694 Fax: (808) 675-3491 Office: BYU–Hawaii Aloha Center 134 ON THE COVER: Jack Soren, midde, a senior majoring in graphic design from Laie, pauses for a photo with friends by a mural they painted in Honolulu. He said his art has transformed from graffiti to artwork people would want to hang in their homes. Photo courtesy of Jack Soren. 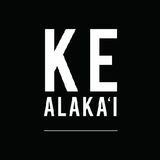 The Ke Alaka‘i began publishing the same year the university, then called Church College of Hawaii, opened. It has continued printing for more than 60 years. The name means “the leader” in Hawaiian. It began as a monthly newsletter, evolved into a weekly newspaper, then a weekly magazine, and is now a monthly news magazine with a website and a social media presence. Today a staff of about 25 students works to provide information for BYU–Hawaii’s campus ohana and Laie’s community. Main characters Frederick and Mabel take a bow at the end of the performance. The Major General surprised audiences with his performance and raps. The police squad performs its comical song and dance number. •4 tbsp. all purpose flour •1/8 tsp. baking powder •1/16 tsp. baking soda •1/8 tsp. salt •3 tbsp. milk •1 tbsp. olive oil •1 tbsp. marinara sauce •1 tbsp. shredded mozzarella cheese •Pepperoni •1/2 tsp. dried Italian herbs (oregano or any of your choice) Mix together flour, baking powder, baking soda, salt, milk and oil inside the mug. Spread the marinara sauce over the batter before sprinkling cheese and adding pepperoni and herbs. Microwave for 1 min. 20 sec. or until batter has risen and cheese is bubbling in mug. Sprinkle on Parmesan cheese and red pepper and enjoy. For roll: •1/4 cup all purpose flour, or pancake mix •1/4 tsp. baking powder •2 tbsp. unsweetened vanilla almond milk or other milk (1-2 tablespoons more, as needed) •1 tbsp. maple syrup •1/4 tsp. vanilla extract •1 tsp. coconut oil For swirl: •1 tbsp. brown sugar •1/4 tsp. ground cinnamon For icing (optional): •1/2 tbsp. unsalted butter •1 tbsp. cream cheese •2 tbsp. powdered sugar Coat inside of mug with non-stick cooking spray. Mix together flour (or pancake mix) baking powder, maple syrup, milk, vanilla, and coconut oil in your mug. Add the 1 to 2 extra tbsp. of milk if mix seems dry. On the side, mix together brown sugar and cinnamon before sprinkling into mug. With a knife, slightly stir in the sugar so the flavor reaches further into the roll. Microwave for 1 min. 25 sec. Slide cinnamon roll out of mug onto plate or eat straight out of the mug. For the icing, prepare the ingredients in a medium sized microwaveable bowl and microwave for around 10 seconds, until the mixture is slightly warm. Whisk contents well before transferring to a piping bag. This makes a lot of icing, which you can save for later or enjoy all at once with roommates. "I think I always knew I wanted to do something in art because I liked the visual side of things. I liked that kind of freedom, and there not being one right answer and one wrong answer." Rob McConnell grades his graphic design students' typography project. Photo by Teva Todd. "I wanted to do something to bring me joy and something I could get fulfillment out of." Left: Rob McConnell with his screenprint from his MFA. Right: McConnell goes through design work from previous years. Photos by Teva Todd. "...then I realized, ‘Why am I stuck behind a computer when I could actually learn to do graphic design and do some stuff?’ I wasn’t really doing things. I went back to school and started doing graphic design." Jihae Kwon holds her book, "Homeless Chickens.” Photo by Anuhea Chen. What is difficult about your job? “Although we try to be very objective, there is some subjective perspective embedded in there a little bit. When students do not trust their teachers and their suggestions and guidance, there’s not much I can do. I try not to force my ideas or my own likings on students. I just let them go. There is a limitation to how much I can do. Even with math, there is only so much math teachers can do. My math teachers couldn’t figure out how to help me do math at all. “The limitation is when I see myself not being able to help my students see what I see. Also when I cannot help them see what I see in them. I see great potential in them, but they don’t trust that. They don’t trust in themselves. "When I see my students doing something I couldn’t do, my work is done. I cannot take any credit for what they accomplish. I'm just nudging them." INSTAGRAM’S INFLUENCE After experimenting for a couple of months, Poort said Hannemann told her she needed to share her art. “I was reluctant at first [to share], but resin is one of the most expensive art mediums, so I had to start selling to pay for more resin.” Poort began posting her pieces and artistic process on Instagram and said it led to opportunities to attend galleries, travel to different countries, and share her love of art. Now with 30,000 followers on Instagram, art has become Poort’s full-time job. ART OVER BFA After graduating from BYUH in 2016, Poort said she wanted to earn a bachelor’s in fine arts (BFA) because it would help her resume and a future career. She said she went to her art professors at BYUH and asked if her resin art could count towards her BFA. They told her that her art would only count if she put a figure in each of her paintings. Poort decided not to get her BFA, and she said it was the right decision because, with or without the degree, she was able to get exponential growth from her Instagram. Astle said, “I honestly could not live without art. It gives me purpose and a sense of fulfillment. I am a creator and nothing brings me more peace, joy, purpose, and meaning than being a creator of art. It makes life even better and it gives people a chance to express your life.” He said he genuinely wishes people would value art more, especially in schools when children are young. If more art was taught at a young age, he said there would be more art produced in the world. “I wish everyone was more serious about art. Every form of art is an expression of your mind. Art is how you give and take from the world around you,” said Astle. Astle works in the BYUH Business Department teaching a class twice a week on video marketing and he has been teaching for almost a year. Along with teaching, Astle does freelance work in videography, graphic design and video marketing for both large and small companies. Astle said he also creates and designs his own shoes in his free time. Some of the companies he has made videos for include DoTerra, Doritos, Better Business Bureau, Crayola, and several other smaller companies and brands. Astle said he remembers art always being a part of his life. His grandfather was a sculptor and even now in his late 90s, his grandfather continues to sculpt. Astle said his mother is also artistic and his older brother is an industrial designer. Astle said his true passion is art and spent his free time in his youth doing art. He said, “My friends and I would create stickers and plaster them in Chinatown in L.A. We would graffiti and paint and create art for fun. In high school, I also took classes at a community college and took fashion and screen printing.” When Astle arrived at BYUH, he was originally studying business but then decided to switch to graphic design because he said he would rather study something he is passionate about and enjoys. What do you do in your video marketing class? marketing tactics. He said in class, he uses a stepby-step guide that helps people gain the skills to create videos. “The class is basically a blend of making a video look good but also figuring out how to market the video in a way that will make companies want to hire you. It is not just a videography class and it is not just a marketing class, but rather a hybrid of the two,” said Astle. Having been in Astle’s video marketing class, Sarah Hardy said, “When you watch James’ videos, you can really tell his passion is reflected in the art he is creating.” The video marketing course taught by Astle focuses on creating content and involves understanding the emotions of people, he said, and it differs from the digital marketing course offered at BYUH. ‘Oh, I could never do that.’ But I think anyone can do it because it’s literally just lines, circles, and dots … leaves or flowers. It’s not anything super hard. I definitely think anyone can Zentangle.” Baxter’s former roommate and good friend Hannah Hahn, a sophomore from Maryland majoring in applied mathematics, said of Baxter’s Zentangles, “They’re awesome. I told her she should sell them because they’re so good. They’re really intricate, and I don’t know how she does it. They [definitely help destress] her because she’s good at them. It’s personalized for her.” Baxter said she has no interest in keeping or selling her art. “I would rather give them as gifts to people who will appreciate them more than me. It’s not like I’m going to hang it up on my wall, like, ‘Cool I drew that!’ I’d just rather give it to someone as a gift to make them happy. always surrounded by it, even in my house. My mother is a big fan of art ... We have a lot of big paintings everywhere.” As the only Ukrainian at BYU–Hawaii, Rudyk said she struggled to fit in at first. “At first, I felt like I didn’t fit into society, but then I found a way to embrace my uniqueness. Accepting, ‘Yes, I’m different. My mentality is different. My country is different. And it’s okay. I don’t have to [change] myself to be like other people who study here. I am myself, I love the way I was raised and everything that’s important to me.’ “I feel like after I started to accept myself the way I am, I became more open with people. I started to let more people come into my life.” This unique mentality is what helped her decide to pursue her different passions, she said. “I want to do many things. On one side of my personality, I want to do fashion and art. On the other side, I want to do more charity work and things like going to Africa and helping people there. I worked for the United Nations agenda helping refugees. I feel like there is a way to combine art, fashion, charity work, and humanitarian help. “At this point, I am confused with what I want to do because I feel like I want to do so many things. My personality has so many different sides I can’t actually accomplish all of that. At this point, it’s just hard. Life gives us opportunities and chances, and we just have to go with them and do our best to get the best experience we can and have the best influence on society and the world.” If someone isn’t sure which passion they should pursue, she advised, “I would say do both. I feel like humans have a great potential that hasn’t been yet discovered, so it’s up to you to discover your potential. We have such a short time on earth, and it’s crucial for us to live in every moment and make the best of it. If you don’t know exactly what you want to do, do both, and you will find a way to work it out.” She said after she graduates, “I would love to work for a fashion magazine, but not like Cosmopolitan, or even Vogue. For me, those are too stereotypical. There are different magazines like IDEA magazine or Esquire. They focus on fashion and art, but more on the contemporary side of it. Things that are experimental, that represent you. I really like that because I feel like as a person, I get bored with things easily. he had to leave in order to continue his studies elsewhere. “I was heartbroken,” he said. “I was in the airport and normally, I don’t receive actual words from Heavenly Father when I pray, but I was praying not to leave Hawaii. “I had this distinct impression that has stuck with me my whole life. I had this voice in my head say, ‘You have to leave so that you can come back,’ and I would wonder what it even meant. So I left, went to CWU where she (Kristl) was getting her master’s, and met her. I did some auditions in New York for Broadway, and got my master’s from Penn State.” During one of his last classes, he said his stage combat instructor told him about a position that had opened up at BYUH. Intrigued, both Kristl and Aaron applied, with Kristl ending up with the job. “This is one of the most, if not the most diverse campus in the world. We really wanted to take advantage of that in the stories that we were telling,” Aaron Densley said. Theatre is the connection between performer and audience, according to Kristl Densley. “Even with those exact same people in the same room, you’re still never going to have the same experience. It’ll be new, and when it’s gone, it lives in our hearts and imaginations, changing the way we view the world.We carry that little bit with us as we go on.” Aaron Densley said he and his wife had noticed so many people were auditioning for the shows on campus. There could be so many who auditioned that there were people who went through their whole experience without getting a chance to perform in front of an audience. Simply because there were not enough roles for everybody. He explained he and his wife took it upon themselves to revitalize the Little Theater and use it more as a theatre space. "Music conveys what language cannot." Connecting with the perfect uke From beginner lessons to expert advice, interviewees share tips on purchasing an ukulele BY PATSY BRERETON Kaʻonohi Hew Len, a BYU–Hawaii senior from California majoring in music, said, “When choosing an ukulele (oo-koo-leh-leh), it’s more than just finding something to play. It’s a connection you are hoping to build. “When you hold an ukulele, you ask: ‘Can I see myself playing this for the next two, five or 10 years? Does this ukulele produce the sound I want? Do I feel right with this ukulele?’” In a Facebook poll, 67 percent of members of the I Love BYU–Hawaii and PCC Facebook groups, said they owned an ukulele, and 8 percent said they would like one. On any day the sound of an ukulele can be heard throughout the BYUH campus. Olivia Griffith, a BYUH freshman from Utah majoring in psychology, said she bought her first ukulele last summer on a trip to the Big Island. Next, decide what size is most comfortable for you to hold and make chord shapes on. Another site, theukulelereview. com says the most common ukuleles come in three sizes. The smallest one, also referred to as the standard size, is the soprano. This one is little and many times big sounding, but usually the soprano is cramping for medium to large hands, especially as you get to more advanced chords. The concert is medium size with a longer neck and more room between the frets, making it a easier to handle. It has, like the soprano, the classic ukulele sound and is louder. It is a popular size, and the second most requested after the next size up, the tenor, which is the size used most often by professionals and guitar players. Xavi doing an opening deejay set for the Grammy Award winning group SOBxRBE, in Honolulu. Photo courtesy of Xavi Herrera. WHAT ARE YOUR MUSICAL INTERESTS? “My favorite musical genre is Bossa Nova, which is Brazilian Jazz. When I was younger I listened to a lot of rock: Switchfoot, AC/DC, Led Zeppelin. I also mingled with Spanish music. In high school, I got really into hip-hop and R&B: Chief Keef, MadeinTYO, A$AP Rocky. “I mostly make rap, trap [a style of Hip Hop] and R&B. I’m also collaborating with some producers from Brazil. I’m planning a trip in April to go down to Rio de Janeiro to work with a big hip-hop producer down there. It’s Brazilian rap. I make a lot of Latin trap.” around the music industry and uncertainties about their future, she said it is important to pursue passions and make a career out of what you love. HOW DID YOU FIND YOUR WAY IN MUSIC PRODUCTION AND GET WITH ARTISTS? “The internet is one of the most amazing things. It opens so many doors. I went from zero to 100 in a month. I was just making beats; I couldn’t get placements with anybody. Nobody on the island. Last year Rojas came to the island and I messaged him on Instagram. I had everyone on my Instagram message him. I told him I wanted to play some music for him” Xavi said he didn’t care if Rojas told him his music was bad. “I just wanted to hear what he thought because I never worked with any other producers. I ended up meeting with him and played beats for him and he said my beats were hard. He invited me to join him on his label and help me get exposure. “From that experience, which was in May, I got some exposure, and I’ve been working with new artists almost every week. I had a placement with Riff Raff, and some well-known guys down in Latin America. It’s really helpful to have someone on the inside. Halliday described how the first time she bleach dyed a shirt, it didn’t go as planned. “My first time dying a shirt was actually kind of a fail, but also a step in the right direction. I was like, ‘Oh yeah, I can just dunk it in the bleach and it will be all fine.’ I sat in the bleach, and was like, ‘Oh, it probably needs to bleach for like an hour.’ I hadn’t really looked anything up the first time. I thought I knew what to do and could figure it out. “When I came back to check on it, I lifted it up, and it just fell apart into the bleach. My friend was with me, and I was like, ‘Umm, this is embarrassing.’ I learned later when you’re bleaching clothing you have to dilute the bleach.” After she learned how to properly make her shirts, she said she realized what it was actually like to start a small business. “I realized you want it to grow so quickly, and you think, ‘Oh yeah, I can make it grow so quick.’ I think with any start-up business it’s a gradual incline. Pursuing a minor in psychology as well, Halliday shared, will hopefully lead her into the field of art therapy. “In the long run, I want to go into art therapy and counseling, so I’ll have to go to a master’s program for that. Right after I graduate, I want to take a little bit of a break before I jump right into school again and work. “I’ll be able to put more time, effort, and commitment to my small business I’ve started up, which will be kind of fun and exciting. I definitely want to find another job as well that will be like a stepping stone for me in the direction of art therapy, whether it’s something more art related or psychology related. I’m not completely sure yet, but that’s the direction I’m going. As for incorporating her business into art therapy, “I definitely feel like it could be incorporated, doing some creating of clothing and art therapy. I haven’t really thought about it. I don’t know how long I’ll be doing this business.” To see more of Halliday’s products, follow her on Instagram @made_bykate_ or visit her Etsy shop MadebyKShop. An said he typically works with what he has when starting a video but always has an idea of what he wants the video to be. “When it comes to planning, it really depends. For example, when I make Korean food and eat with friends, I just film spontaneously. No idea of how it will go. Just improv from my friends and I. Sometimes being spontaneous leads to some really crazy fun things coming up. “If I go to somewhere like Honolulu, I have more of a plan,” An explained. “I decide which building and which street I need to show because I don’t want to waste time or use up memory in the camera. An said editing is what can turn a boring video into something exciting and dynamic.“It can make all the difference. To any [one who is] starting out making videos, I would say give it a chance. I am only where I am today because I kept on trying to make videos. Thirty percent of making a video is the actual filming, while 70 percent is editing. "I want to capture Hawaii in my videos... the real Hawaii." think the Church is an old Church. It's 189 years old. But it's only the beginning. “Just project out what the next future will be and the Church is going to have an unprecedented future. Unparalleled. We're just building up what’s ahead now." Top: President Russell M. Nelson meets with Catholic Pope Francis inside the Vatican. Bottom: The baptistry with its oval design. incredible, especially as we approach the Second Coming. “It’s [Italy's] amazingly beautiful people will come without really knowing what the temple is. When I served my mission, tons of people had never even heard of Mormons. Now that is changing because of the temple.” Hansen shared, “The members in Rome and from all over the country have taken time off of work and school to come volunteer for the open house and to clean and prepare the temple. “Can you imagine being a student and going to the Laie temple every day after class to give tours, organize, clean, explain, and talk to visitors until 9 p.m.? It’s amazing.” Pres. Nelson said, “We are grateful for the support of church, government and civic leaders who have offered much-appreciated goodwill in our desire to build this holy temple here in Rome.” Peterson said she gave photos of temples to a shop owner she often visited as a missionary. While she was visiting Napoli, Italy, she went to his shop and met with him again. them remember this is Christ’s Church, not an American church,” said Hansen. The Rome Temple began operation on March 19. It is projected to serve about 27,000 Latter-day Saints in Italy. It is the Church's 162 operating temple, with another 40 announced or under construction. • Top: The celestial room. Bottom: The Christus statue with the statues of the Twelve Apostles. early Hawaiian converts to the Church of Jesus Christ of Latter-day Saints in the Islands, they would have endured breaches of apostasy within the Church, and general persecution from without What’s more, as native Hawaiians they would have endured epidemics of disease leading to the death of much of their race, tumultuous governance, and unimaginable world change. The fate of the husband is unknown, but we later learn that Sister Manuhii remained connected to her faith. And remarkably, more than sixty years later, this devoted sister and the young missionary she cared for were reunited on a pier in Honolulu in 1909. She called out for “Iosepa,” Joseph, and he instantly ran to her, hugging her and saying, “Mama, Mama, my dear old Mama.” The boy she had cared for was now the prophet of the Church, Joseph F. Smith; and the caring sister, now blind and frail, had brought him the best gift she could afford—a few choice bananas. President Joseph F. Smith is the son of Hyrum and Mary Fielding Smith. His father was killed along with the Prophet Joseph Smith Jr. when Joseph F. was 5 years old.